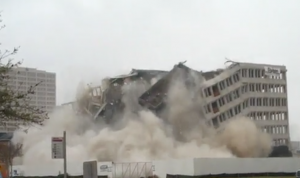 A leading national commercial demolition contractor providing complete or partial demolition. Cherry Company has successfully completed demolition projects in over 17 states throughout the Gulf Coast and Midwest as well as internationally. Demolition structures we work on vary in size and type from hotels to high-rise office buildings to strip malls and warehouses. Cherry was called in to help with the demolition of the Astrodome and was chosen by Macy’s to demo their downtown Houston location, which at the time took up an entire city block. Cherry operates one of the largest demolition equipment fleets in the Gulf Coast area. Additionally, as one of the largest concrete recyclers in the US, we can also provide on-site recycling for your demolition process, which can add significant savings on concrete excavation, removal, and landfill costs. Cherry is a long-term member of statewide and national organizations, including the National Demolition Association, the Associated General Contractors (Building Branch & Heavy Highway Committees), the Association of Builders and Contractors and the Construction Materials Recycling Association. These and other organizations recognize our commitment to professional standards. The “Cherry Advantage” is full-service professionalism. Our demolition teams bring additional value to every project because of their capabilities and expertise. By following the U.S. Green Building Council’s requirements and guidelines, we help customers meet LEED (Leadership in Energy and Environmental Design) Certification requirements. By using recycled products instead of natural aggregates, your project can be better positioned for LEED Certification. As further value to customers, several of our employees have obtained their Green Advantage Environmental Certification.